As promised, I'll be giving away another book today. It's good to share. Today's free book is one that pastors/preachers/ministry leaders should definitely read: The Crucifixion of Ministry: Surrendering Our Ambitions to the Service of Christ. If you have been struggling in ministry, trying to do everything yourself, being so busy about the business of doing church, meeting expectations, trying to be an uber-pastor, youth leader, ministry leader... then you definitely need to check this book out. I will have the privilege of studying under Dr. Purves in January. 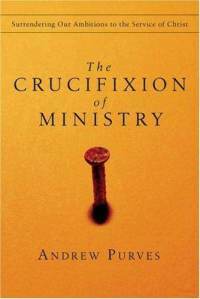 I did a short review of The Crucifixion of Ministry on this blog, which you can read here. The first person to comment, gets this great book mailed to them!